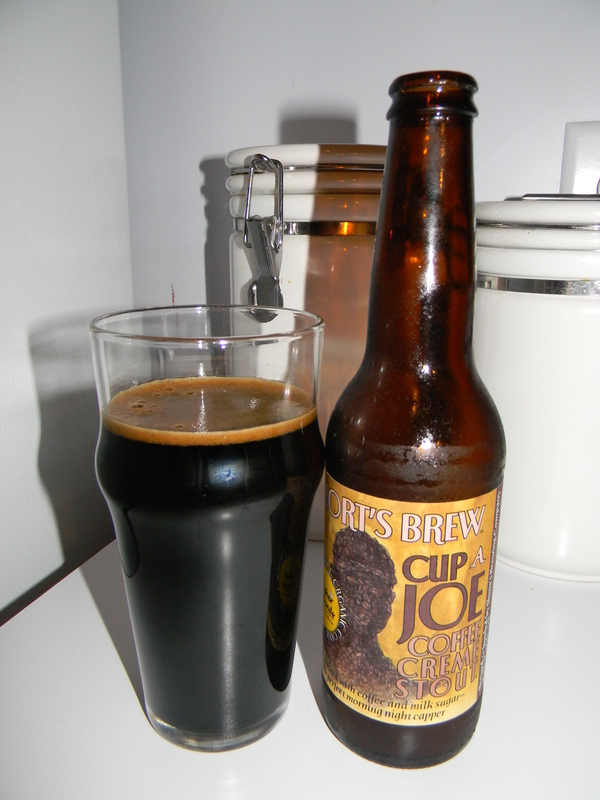 Short’s | Beer Apprentice - Craft Beer News, Reviews, Interviews and Info. Hello everyone. I hope all is well. For today’s craft beer review I’m going to be trying the India Spruce Pilsner brewed by the Short’s Brewing Company located in Elk Rapids, Michigan. I’ve only had the opportunity to try a couple of Short’s beers in the past, but I’ve found them to be very solid, so I’m hoping that this one holds true to my past experiences. 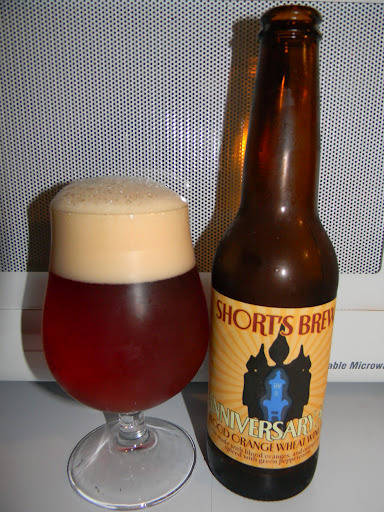 Let’s check the website, shortsbrewing.com, and see what kind of information we can find about this beverage. This Imperial Pilsner, fermented with local, hand-picked blue spruce tips is the quintessential symbol for Joe Short’s love of hops and craft beer. The spruce presence, rooted in historical brewing practices, is enormous and gives the beer a refreshing quality reminiscent of gin. 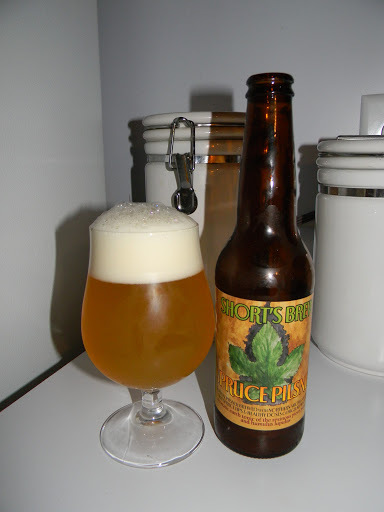 This beer is impressively light bodied, considering the immense spruce flavors and the prodigious additions of hops. This beer came in a 12 oz. bottle and the ABV was around 7.0%. It poured a very hazy, orangish/yellow color. It looked a lot like pineapple juice to be honest. The head was very large, frothy, soft and somewhat soapy. The retention time was excellent and the lacing was thick, sticky and very clingy. Quite a bit was left behind on the glass for the entire drink. A very, very nice looking beer. The aroma had a very forward, however very pleasing nose of spruce. It smelled of pine needles for sure. It was almost medicinal smelling. Like a clean, sanitized Doctor’s office or something. Some light Pilsner malt and breadiness helped counterbalance some of that and I even got some nice earthy tones and a touch of lemon citrus to boot. Very unique. The taste presented more of the spruce needles. A bit resiny too. The lemony aspects seemed to be a little more prominent as well. I was even detecting some kind of spice. I couldn’t quite put my finger on what type though. The flavor was considerably bitter, yet not over the top. Very manageable I thought. The mouthfeel was medium bodied. Dry and smooth, but crisp. A wee bit of warmth was felt and the carbonation was of medium strength and agreeable. A nice shot of flavor was left behind on the palate after each sip also. Overall, this beer was favorable. It’s as individualistic and different as anything I’ve really ever had. The spruce never really died down as I went along and it became a bit difficult for me to drink toward the end, yet I had no trouble completing the bottle. I’m guessing that my palate was just a bit distressed by the time I finished. I doubt that this would be a beer that I could drink everyday, but I’m sure glad that I got the opportunity to try it. I think you guys should pick up the Short’s India Spruce Pilsner if you get the opportunity. I’d really be interested in hearing your opinion. If you’ve tried it, did you like it? Please leave a comment if you wish. Hello everyone. For today’s craft beer review I’m going to be drinking the Blood Orange Wheat Wine Anniversary Ale produced by the Short’s Brewing Company located in Elk Rapids, Michigan. This brew is another gift from Mr. Liquid Bread and thus far I’ve really enjoyed all of the Short’s products that he has sent me. Let’s see what we can find out about this brew from the company website, shortsbrewing.com. A high gravity wheat wine made with blood oranges that render an alluring dark purple hue to the color. Flavor abounds from the spice of green peppercorns and tang from blood orange zest. Aggressive dry hop additions amplify the citrus overtones and spiciness found throughout. ‘Anni’ Ale typifies the full magnitude of Short’s Brewing Company by embodying all the complexities and fulfillment necessary to pay tribute to another year of brewing. This beer comes in at 10.0% ABV and in a 12 oz. bottle. It poured a slightly hazy ruby red color with a very nicely sized off white crown. It was smooth and very soft with a thick soapiness to it. The retention time was excellent and the lacing looked pretty darn good too. A gorgeous looking beer I thought. The nose brought forth hints of orange citrus and sweet mango. Very candy like. It kind of smelled like those dreamsicle cakes that you buy at sweet shops. Very pleasing. After the brew warmed a touch I was able to pick up a few notes of the light pepper. Not too much though. Just enough to create a bit of complexity. The taste was very similar to straight orange juice with tons of added sugar. Like an orange julius or something. The bitterness was easily manageable however. The spicy peppercorns were, again, noticed after the brew warmed and like the smell weren’t extremely prominent. Not the most elaborate flavor, but it was quite tasty. The mouthfeel was medium bodied. Rather dry, sticky and smooth. Very good, lively carbonation as well. A ton of flavor was left behind on the palate long after the sip was gone. Well, I thought this was a very nice and somewhat unique brew. It’s a touch one dimensional, but that’s ok. Sometimes I find that if a brew is too complicated I get a bit confused. It’s definitely worth a try if you can obtain a bottle. It did become a tad bit sweet and “fruity juicy” towards the end, which lowered the drinkability somewhat, although I was still able to finish it easily. I had to drink a full bottle of water afterwards just to cleanse my palate though. Again, a big thanks to Mr. Liquid Bread (Chris Phillips) for sending me the Shorts Brewing Blood Orange Wheat Wine Anniversary Ale. Be sure to check out his Youtube page for some entertaining and informative beer reviews.